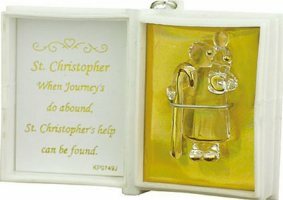 Devotional key rings and key chains, including Saint Christopher and Lourdes. Blue Enamel Miraculous Cross Key Chain. Lourdes Sanctuary Laser Crystal Key Chain. Green Enamel Miraculous Cross Key Chain. St Benedict Key Ring Key Chain. St Peregrine Rosary Ring Key Chain. Saint Christopher Figurine Inside a Book. Don't Text & Drive Key Ring. Footprints Key Ring with Verse. Child of Prague Rosary Ring Key Chain. Rosary Key Chain - St.Christopher / Lourdes Apparitions.